Easily accommodates 4 adult sized helmets and more! 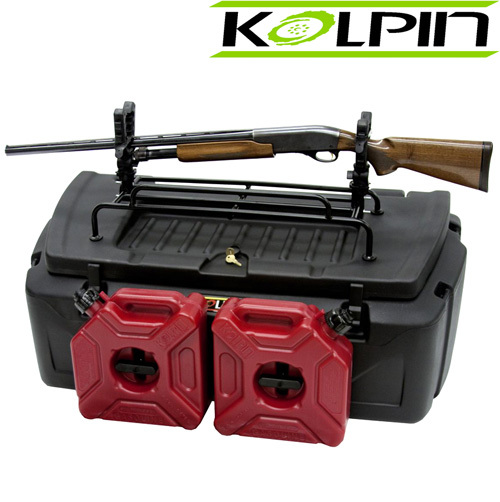 Largest hard-sided storage box offered by Kolpin! Reinforced structure accepts (2) Fuel Pack Jr's with mounting brackets. Lid has molded-in tray and double wall construction for extra storage capacity and rigidity. Includes Kwik-Cinch straps for quick on/off attachment and metal Accessory Rack for increased load carrying capacity. Front to back base footprint - 13" in the center between the rear of the seat to the rear of the rack, 19" on the outside.